Welcome to the Tulip Tie Dye Your Summer website, operated by Tulip, a Duncan Enterprises Company (“Tulip”) and located at www.tiedyeyoursummer.com ("Site"). The following terms and conditions (“Terms”) govern your use of the Site. In order to access certain content, material, products or services on the Site, you may be asked to register and create an account. As part of the registration process, you may be asked to click to agree to these Terms, and may then be asked to select or submit a user name and password. You may also be required to provide us with certain information about yourself including some types of personally identifiable information, including your legal name, phone number, address, email address, gender, and age. You are responsible for ensuring that your password and account login are kept secret, safe, and secure at all times. Tulip will not be held responsible or liable for any misuse of your account in the event that a third party has access to and uses your password and account login in any way. Tulip wants everyone out to have an incredible experience with our products! Your satisfaction is a top priority for us, and Tulip will gladly replace any product that you order from the Site and receive in damaged condition. Unfortunately, due to the nature of our products, Tulip is unable to offer returns or exchanges for any other reason. To be eligible for a return, you must provide a proof of purchase, as well as the unused damaged product in the original packaging. You may choose whether you would like a refund or a replacement product. 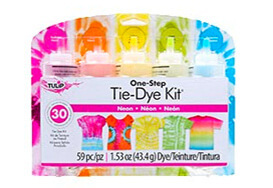 To arrange your refund or replacement product, please contact our Tulip Tie Dye Your Summer Customer Loyalty Team for instructions on how to return your damaged product. f) Reproduce, duplicate, copy, sell, trade or resell any products or services bearing any trademark, service mark, trade name, logo or service mark owned by Tulip in a way that is likely or intended to cause confusion about the owner or authorized user of such marks, names or logos. As between you and Tulip, Tulip owns or licenses all information and materials, including logos, designs, titles, phrases, product names, images, illustrations, icons, photographs, and the copyrights, trademarks, service marks, trade dress, and other intellectual property rights associated therewith, in or made available through the Site (“Site Content”), as well as the selection, coordination, arrangement, and organization and enhancement of the Site Content. All Site Content is protected pursuant to copyright, trademark, patent, and other applicable laws. You agree not to remove or alter any copyright notice or any other proprietary notice on any Site Content. As between you and Tulip, all names, trademarks, symbols, slogans, or logos appearing on the Site are proprietary to Tulip or its affiliates, licensors, or suppliers. Use or misuse of these trademarks is expressly prohibited and may violate federal and state trademark law. Under no circumstances will you have any rights of any kind in or to the Site Content, other than the right to use the Site Content in accordance with these Terms. Certain features of the Site may allow you to contribute feedback and other information to the Site for access, use, viewing, and commentary by other users of the Site (collectively, “Comments”). By posting Comments, you represent that you have the full legal right to provide the Comments and that use of the Comments by Tulip on the Site, and all other persons and entities, will not: (a) infringe any intellectual property rights of any person or entity or any rights of publicity, personality, or privacy of any person or entity, including as a result of your failure to obtain consent to post personally identifying or otherwise private information about a person; (b) violate any law, statute, ordinance, regulation, or agreement; or (c) constitute disclosure of any confidential information owned by any third party. Upon your submission of Comments or other material or information to Tulip, you grant Tulip a worldwide, perpetual, irrevocable, transferable, license to access, use, distribute, reproduce, display, modify, create derivative works based upon, and sublicense the Comments, all without any compensation to you whatsoever. For avoidance of doubt, Tulip shall be under no obligation: (1) to maintain any Comments in confidence; (2) to compensate you in any way for your Comments; or (3) to respond to any Comments. Tulip reserves the right to change the assortment of items offered and to limit the quantity of items that may be purchased from time to time and at any time, without prior notice. We also reserve the right to alter the terms or duration of any special offers or sale promotion. Tulip is not liable in case of stock outage or unavailability of products. We have made every effort to display as accurately as possible the colors of our products that appear at the Site, but we cannot guarantee that your computer monitor's display of any color will be accurate. Tulip expressly disclaims, to the fullest extent permitted by law, any express or implied warranties: (i) that the Site, Services, Site Content, goods, advice, information or links provided on the Site will meet your requirements; (ii) that the Services will be uninterrupted, timely, secure or free from error; (iii) that defects in the operation or functionality of any software provided to you as part of the Services will be corrected; (iv) regarding the Site Content, goods, services, advice, information or links provided by any third parties or users; (v) that the Site, Site Content, goods, services, advice, or information displayed on the Site will meet your requirements; and (vi) that the Site will be error-free or that any errors will be corrected. No advice or information, whether oral or written, obtained by you from the Site shall create any warranty not expressly stated in these Terms. You understand that the technical processing and transmission of any Site Content and Comments may be transferred unencrypted and involve transmissions over various networks and changes to conform and adapt to technical requirements of connecting networks or devices. Please be advised that we do not guarantee that any information sent to or from our Site will be secure during transmission, nor can we guarantee the confidentiality of any communication or material transmitted to us via the Site or the Internet, including, for example, personal information such as your name or address. Tulip assumes no responsibility for: (a) any error, omission, interruption, deletion, defect, delay in operation or transmission, communications line failure, theft or destruction or unauthorized access to, or alteration of, any communication; and (b) any problems or technical malfunction of any telephone network or lines, computer online systems, servers or providers, computer equipment, software, failure of any email or players due to technical problems or traffic congestion on the Internet or on any of the Site, including any injury or damage to you or to any person’s computer related to or resulting from use of the Services or the Site. IN NO EVENT WILL TULIP BE LIABLE FOR DAMAGES OTHER THAN ACTUAL AND DIRECT DAMAGES PROVEN IN A COURT OF LAW. IN NO EVENT SHALL TULIP’S LIABILITY EXCEED THE PRICE YOU PAID FOR THE PRODUCT OR SERVICE THAT IS THE SUBJECT OF THE CLAIM. IF ANY PART OF THIS LIMITATION OF LIABILITY IS FOUND TO BE INVALID OR UNENFORCEABLE FOR ANY REASON, THEN THE TOTAL LIABILITY OF TULIP AND ITS LICENSORS SHALL NOT EXCEED TEN DOLLARS ($10). Without limiting the foregoing, you understand and acknowledge that Tulip shall not be liable to you for: (a) Any indirect, incidental, consequential, punitive or exemplary losses which may be incurred by you arising out of your use of, or inability to use, the Site or the Services, including any loss of profit (whether incurred directly or indirectly), any loss of goodwill or business reputation, or any loss of data suffered by you; or (b) Any loss or damage which may be incurred by you as a result of: (i) any reliance placed by you on the completeness, accuracy or existence of any advertising, or as a result of any relationship or transaction between you and any advertiser or sponsor whose advertising appears on the Site or the Services; (ii) any changes that Tulip may make to the Site or Services, or for any permanent or temporary cessation in the provision of the Services (or any features within the Services); (iii) the deletion of, corruption of, unauthorized access to, or failure to store, any content and other communications data maintained or transmitted by or through your use of the Site or the Services; (iv) the use of any products or services obtained on or through the Site; or (v) any other matter relating to the Site, the Services, the Site Content, or the Comments. Any dispute arising out of these Terms shall be resolved exclusively through final and binding arbitration conducted by the American Arbitration Association (the “AAA”). Arbitration uses a neutral arbitrator instead of a judge or jury, and court review of an arbitration award is very limited. However, an arbitrator can award the same damages and relief on an individual basis that a court can award to an individual; and an arbitrator must also follow the terms of these Terms, as a court would. All issues are for the arbitrator to decide, except that issues relating to arbitrability and the scope or enforceability of this agreement to arbitrate shall be for a court of competent jurisdiction to decide. Arbitration shall take place in Fresno, California, unless Tulip elects otherwise. The arbitrator will decide the substance of all claims in accordance with the laws of the State of California. The arbitrator shall not be bound by rulings in prior arbitrations involving different Tulip users, but is bound by rulings in prior arbitrations involving the same Tulip user to the extent required by applicable law. The arbitrator's award shall be final and binding, and judgment on the award rendered by the arbitrator may be entered in any court having jurisdiction thereof. Payment of all filing, administration, and arbitrator fees will be governed by the AAA's rules, unless otherwise stated in this Agreement to Arbitrate. If the value of the relief sought is $10,000 or less, at your request, Tulip will pay all filing, administration, and arbitrator fees associated with the arbitration. Any request for payment of fees by Tulip should be submitted by mail to the AAA along with your demand for arbitration and Tulip will make arrangements to pay all necessary fees directly to the AAA. If the value of the relief sought is more than $10,000 and you are able to demonstrate that the costs of accessing arbitration will be prohibitive as compared to the costs of accessing a court for purposes of pursuing litigation on an individual basis, Tulip will pay as much of the filing, administration, and arbitrator fees as the arbitrator deems necessary to prevent the costs of accessing arbitration from being prohibitive. In the event the arbitrator determines the claim(s) you assert in the arbitration to be frivolous, you agree to reimburse Tulip for all fees associated with the arbitration paid by Tulip on your behalf that you otherwise would be obligated to pay under the AAA's rules. If an arbitrator or court decides that any part of this agreement to arbitrate is invalid or unenforceable, the other parts of this agreement to arbitrate shall still apply. You can choose to reject this agreement to arbitrate by mailing us a written opt-out notice (“Opt-Out Notice”). The Opt-Out Notice must be postmarked no later than thirty days after the date you accept these Terms for the first time. You must complete the Opt-Out Notice form by providing the information called for in the form, including your name, address (including street number and address, city, state, and zip code), phone number, and the email address used to log in to the Tulip account to which the opt-out applies. You must sign the Opt-Out Notice for it to be effective. This procedure is the only way you can opt out of the agreement to arbitrate. If you opt out of the agreement to arbitrate, all other parts of these Terms will continue to apply. Opting out of this agreement to arbitrate has no effect on any previous, other, or future arbitration agreements that you may have with us. The Site is controlled and operated from within the United States. Without limiting anything else, Tulip makes no representation that the Site, Site Content, Comments, services, products, information or other materials available on, in, or through the Site is appropriate or available for use in other locations, and access to them from territories where they are illegal is prohibited. Those who choose to access the Site from other locations do so on their own volition and are responsible for compliance with applicable laws.